There's something quite liberating about being able to whip off your tights as winter draws to an end. 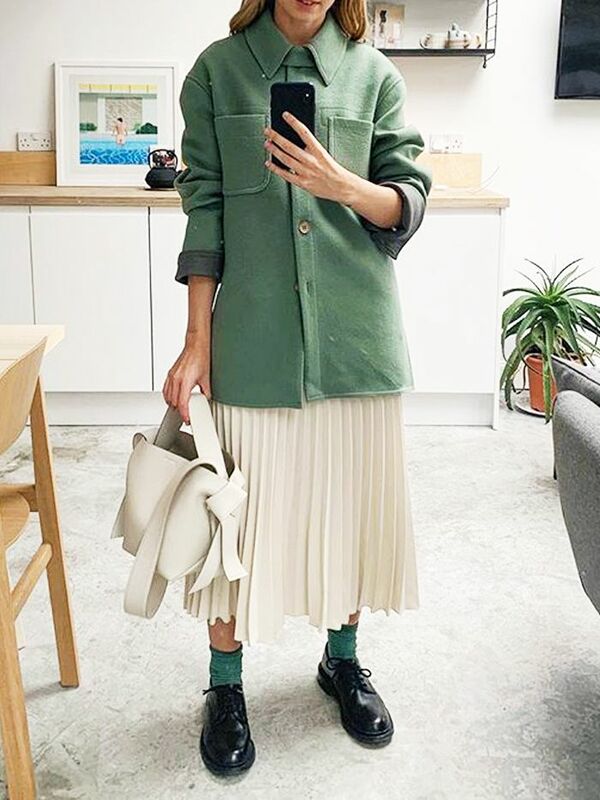 Although this isn't within sight for many of us (some brave souls in the WWW team simply refuse to wear hosiery) the spring/summer skirts filtering in online are making us wonder if we should book in a pedi in preparation for the grand calf-and-foot reveal! While we're still nestled in coats and jumpers, Topshop's new-in sandals are already selling out and street stylers are wearing the latest spring jacket trends. Plenty of proof to confirm that now is indeed an entirely legitimate time to look to spring and summer buys, before the best bits go. So, which skirts are looking like they'll shape up to be this season's heroes? Animal prints are still prowling around, we'll be taking inspiration from the hues of highlighter pens, and one particular nineties trend will make you feel seriously nostalgic. 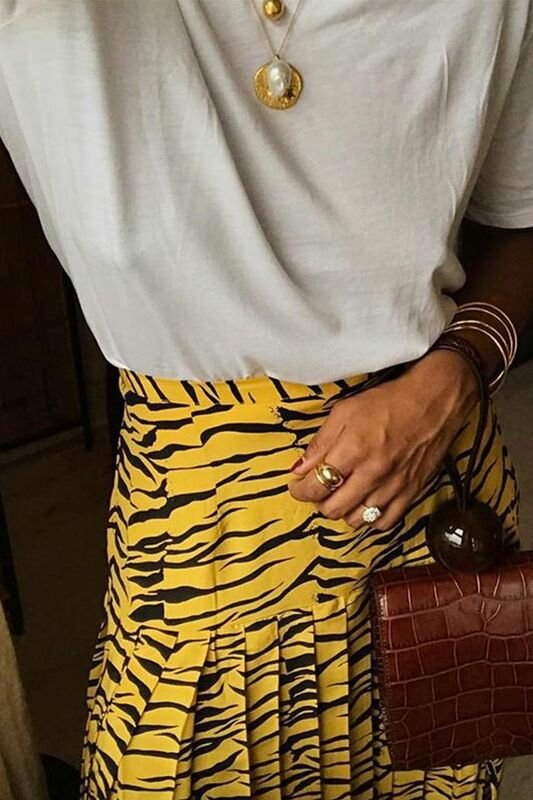 Scroll down to shop the 6 spring skirt trends already being snapped up by Instagram's most stylish. Style Notes: We guarantee almost everyone owns a hint of animal print already, but for spring it has a new look. Make like Monikh and go for colour-pop shades of any animal print you fancy, from zebra to leopard and tiger and back again. You won't regret it. Monikh wears the similar yellow style also from Rixo. The slip skirt is of course still reigning supreme. Wear with a chunky knit and knee high boots for now. We can see this with a white vest top for spring/summer. Style Notes: Like the wrap dress, the wrap skirt is universally flattering. The sleek style suits ost body shapes and looks effortless at all times. We're all about the midi to maxi lengths to make them work across all seasons. You'll wear this with anything from boots to a bikini. An asymmetric hem is also key for spring. polka dots are another trend to tick off. Style Notes: Taking style tips from highlighter pens isn't something we thought would happen, but that's fashion for you. A neon midi skirt is an easy way to wear the trend; luckily, they're all over the high street and designer rails. Go loud and proud with other brights, or mix and match with neutrals. Add a grey sweater and you've got a winning look. Button down skirts are also essential. Guaranteed to make a statement. We can't get enough of the belt detail. Style Notes: By this point we've spent months in tights, so a way to draw attention to our now bare legs is more than acceptable. Fancy fringing and tassels make for the hero hemline we all desire come spring. Stick to monochrome for even more chic. It's just asking to be worn at a cocktail bar in the sun. Add sandals and a one shouldered top come summer. You'll see this all over Instagram. Style Notes: With the ongoing return of all things nineties, comes logos (of course). Courtney's retro Dior print is making us want to try it out in all its glory. Look to the likes of Versace, Fendi and Balenciaga to fulfill all your needs. There's also a matching knit. It's an easy way to update denim. Pleats, logos, asymmetric hemline and belted– hello, hero skirt. Style Notes: Pleated skirts make a reappearance every few years; this time round, it's the print we're interested in. Whether you go checked, arty or micro, we've got time for all of them. From Gucci to Arket, there's one out there for anyone, trust us. If in doubt, go mono. We can see this with a clashing print sweater. It'll be our lucky skirt. Now you know what skirts to shop, these are the rest of the spring trends to buy used and new.